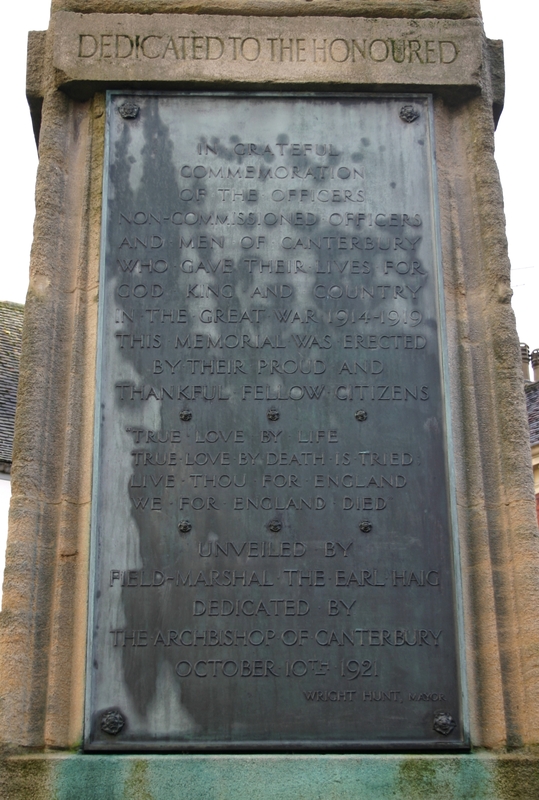 In 1919, a committee was formed for establishing a memorial to commemorate the men of Canterbury who fell in the Great War. The Dean and the Lord Mayor of Canterbury for the time being would be ex officio President and Chairman of the committee respectively. After considering various other options, such as the founding of a new polytechnic or converting the cattle market into a pleasure garden, they decided to build a cross in the Butter Market, just outside the Cathedral’s Christ Church Gate. This was already the site of the Marlowe Memorial, which had to be re-located. The architect chosen was Beresford Pite. The Committee had to determine a definition of ‘man of Canterbury’ and decided that, as a general rule, a serviceman had to have been resident in Canterbury when he joined the Armed Forces and went to war. Those who did not fulfil this qualification, even if they were born in the city or had lived in it for a prolonged period of time, were not usually to be included. The Honorary Secretary of the Committee, John Topliss, was charged with compiling a list of the names of men who met this qualification. Advertisements were posted in the local papers asking for bereaved families to send in the names and details of dead relatives who qualified and the majority of the material amassed by the Committee, now held at the Cathedral Archives within the historic archive of the City of Canterbury (ref CC/W/15), is composed of this correspondence. There are many sad stories amongst those letters, such as that of Edward Kemp, whose sons Harold and Albert were both killed in 1914 on their way to war, the former in India and the latter while training in Australia. Two men born in Canterbury, Ernest Lye and Charles Parren, had moved to America by 1914 and fought in the American Army. They were excluded from the memorial, as were Sergeant Allan Newport and Corporal William Watson, who were both living in Canada when war broke out. Private Charles Silsby, native to Canterbury, but who fought with the 2nd Canadian Mounted Rifles, was included. Letters were also sent in from institutions and parishes, giving great blocks of names, without the moving detail that accompanies the personal letters. Even these, however, contain some interesting information, such a list from the parish of Saint Gregory, which names amongst the dead Ethel Frances Mary Parker, noted specifically as a ‘woman’. Since the memorial as it now stands gives only initials, rather than complete Christian names, E. F. M. Parker’s remarkable distinction from her fellow servicemen is unnoticeable. Also included were men who died because of the war but not in it. A number of men died of injuries acquired or disease contracted during the fighting but did not succumb until after the Armistice, such as Private Cecil Chambers and Private Fred Jordan, who both died of pneumonia, at Salonica and Cairo, on 30 December 1918 and 20 February 1919 respectively. Although most of the men killed were soldiers, a number of sailors and airmen of Canterbury also perished. Stoker Ernest Rogers was torpedoed on 12 September 1918, on his way home from Egypt. Royal Marine Private Ernest Farmer was torpedoed on HMS Goliath in the Dardanelles on 13 May 1915, after 21 years’ service. First Air Mechanic Sidney Holmes of the Royal Flying Corps, which preceded the Royal Air Force, was killed in France on 3 August 1916; especially striking is the case of Major Edward ‘Mick’ Mannock, originally of the Royal Army Medical Corps but who, by 1918, was in the newly formed Royal Air Force. He won the Military Cross twice and the Distinguished Service Order thrice. His death in battle earned him the posthumous Victoria Cross and a memorial in Canterbury Cathedral. The most affecting letter in the collection is not a letter from a relative or a set of committee minutes. It is a letter home from a solder, Private Bert Hart, to his siblings Will and Harriet. His sentences run together and he writes ‘his’ for ‘is’, which could be a sign of a spirit broken by the conflict. Writing from Egypt, he complains of the 140-degree heat and expresses the desire to be transferred to France. He reminisces about songs and home and fully expects some leave, or even the end of the war, before too long. It is not clear why this this letter ended up with the War Memorial Committee papers, and there is no further material on Private Hart himself but his fate is apparent on the memorial, which names among the dead ‘Hart, B.’. The research for the list of names took so long that the committee decided to unveil the memorial without them, to be added later, inscribed on tablets of bronze. The unveiling was performed on 10 October 1921 by Field Marshal the Earl Haig, with the memorial dedicated by the Archbishop of Canterbury, Randall Davidson. It was not until the following year that the tablets were finally fixed, with additions (and deletions) still being made to the draft list even at a late stage. The various armed forces are represented by the figures carved around the memorial, bearing coats of arms: An airman bears the arms of Kent, a sailor the Archbishop of Cathedral’s arms and a soldier the Black Prince’s arms. At the front of the memorial, Saint George bears the arms of the City of Canterbury. The inscription, which runs around the memorial, reads ‘Dedicated to the honoured memory of the men of Canterbury who fell in the Great War 1914–1919’. For a transcription of the memorial, supplied by the Imperial War Museum’s War Memorials Archive (IWM WMA 1592), click here.